It is World Breastfeeding Week, and… well… I don’t know. As someone who has been on both sides of the breastfeeding ‘debate’ (and yes, there still is one! ), as a mother who was scarred by her inability to breastfeed, and now as a mother who celebrates the joy that is breastfeeding and is even pursuing a career based around it, I remain unsure of how I feel about a week dedicated to breastfeeding awareness. It is vital that those mothers who feed their babies through other means do not feel shame when this week is promoted. It is vital that they do not see it as another wound to their heart. To me, this week shouldn’t only be about celebrating breastfeeding — it needs to be about education. I’m not even necessarily talking about the education of mothers and mums-to-be here: I have heard too many stories — hundreds, perhaps — of women who desperately wanted to breastfeed, but who received ill-informed advice from medical professionals that resulted in the sabotage of their breastfeeding relationship. This week should be about raising awareness in society and within the social and medical systems around these women to allow them to achieve their goals and dreams, whatever they may be. I don’t want to talk about the medical benefits of breastfeeding – it has never been about that to me. It is about my instincts; about that burning primal urge in me to be the body that nourishes my child, both inside and outside of my belly; about my dream of motherhood. People need to talk less about the milk and more about what women want. I want to live in a world where the word ‘choice’ isn’t used to make mothers feel less guilty about a medical system that failed them. I want to live in a world where no mother feels uncomfortable feeding their child — not feeling the need to cover herself and her baby, and not feeling that she wants to hand out pamphlets to everyone that watches her prepare formula, so that they truly can understand what she has been through. I want to live in a world where no mother feels shame when feeding, and sadly that is currently so far from the truth, with both breastfeeding and non-breastfeeding mothers. All mamas need to feel proud of having gone through what they have in order to keep their babies fed and healthy. Busting my gut and pushing myself to the brink in order to achieve a breastfeeding relationship with my baby is a choice of mine; it is personal, it is deeply emotional in ways that are impossible to articulate, and I thank every person who has supported me throughout, whether that be through actively offering hugs and high fives, or through choosing to omit criticism. Next time you see a bottle feeding mama, know that there is a chance that she is just like I was — that a system failed her, that she is sad and stressed beyond belief, that she is heartbroken at not being able to fulfil her dreams, that she feels judged for not being able to do what is deemed as ‘best’. Send her love, send her support. Next time you see a breastfeeding mama, know that there is a chance that she is just like me — that she is filled with doubts and never knows if she is doing the right thing, that it is so very far from easy, that she has been through so much to even be able to bring that baby to her breast, and that she hopes that one day she won’t regret how hard she has worked to get to this point. Send her love, send her support. Maybe it should be called "feed your baby with love week"?! ? The only people I felt judged by for not trying long and hard enough were the breastfeeding consultants at the hospital. After that? Nobody ever made me feel bad about giving my baby formula. As for myself, I was too busy recovering from giving birth to regret not getting the full breastfeeding / bonding experience. As soon as my son was ready for solids I made the best, organic, home made carrot mash, applesauce, you name it. So agree about this being a week about education. So much misinformation and shaming. Thanks for sharing. I love this post. 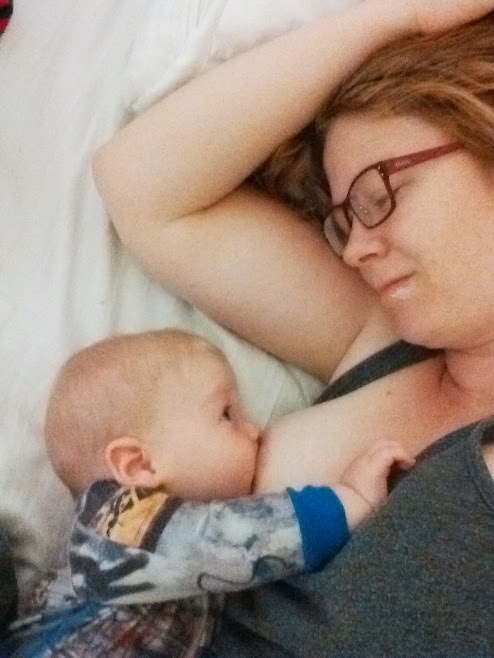 My breastfeeding journey started very rough and there were a lot of tears and plenty of bottles of formula in my daughter's first month of life. I think I was the one who was hardest on myself, though. Haha! Boy, do I understand that! Oh Tamara, I'm so sorry you felt judged by the breastfeeding consultants. That's so hard. I'm working as a breastfeeding consultant and I sometimes wish there was another name for it… I don't want to push women to breastfeed, I just want to enable them to be able to find solutions that work for them so that they never feel regret. I'm sorry you didn't have wonderful, compassionate support!